A meme of a black doll that was found hanged in an elevator at Canisius College later popped up online. A black doll was found hanged from a rope inside an elevator at Canisius College in Buffalo, N.Y., WGRZ reports. 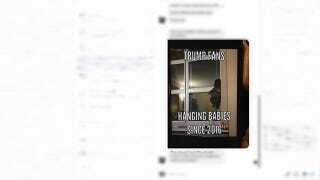 Students notified the news station and said that the doll was later taken out of the elevator, only for an image of it to resurface later as a meme online that read, "Trump Fans … Hanging Babies Since 2016." The president of Canisius College, John J. Hurley, wrote a letter to students regarding the hanging, saying, "We will hold responsible whoever perpetuated this despicable act that goes against everything for which Canisius College stands. I cannot condemn this strongly enough. This cannot and will not be tolerated on the Canisius campus."